Your muscles are usually strong and tight enough to keep your organs and intestines in place, but a hernia can develop if there are any weak spots. Umbilical hernias are very common in infants and young children, particularly in babies born prematurely. An umbilical hernia appears as a painless lump in or near the navel (belly button). It may get bigger when laughing, coughing, crying or going to the toilet and may shrink when relaxing or lying down. 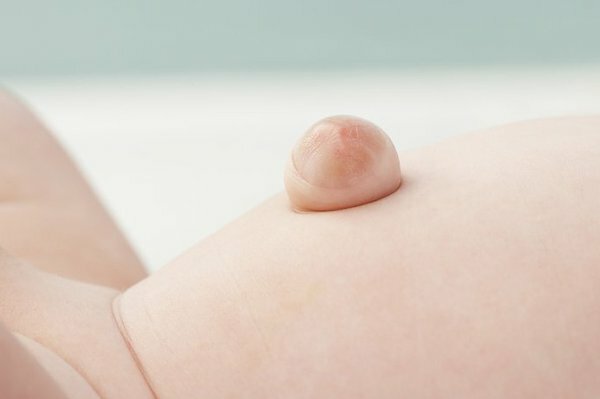 In many cases, the umbilical hernia goes back in and the muscles reseal before the child's first birthday. Umbilical hernias can also develop in adults. Without treatment, the hernia will probably get worse over time. During pregnancy, the umbilical cord passes through an opening in the baby's abdomen (tummy). This opening should close shortly after birth, but in some cases the muscles don't seal completely. If necessary, umbilical hernias can be treated with surgery to push the bulge back into place and strengthen the weakness in the abdominal wall. This operation may be recommended for your child if the hernia is large or hasn't disappeared by the time they reach 3 or 4 years old. You'll usually be advised to wait for your child to reach this age because the operation isn't essential unless there are complications. The risk of your child developing complications is very low. Surgery is recommended for most adults with an umbilical hernia because the hernia is unlikely to get better by itself when you're older and the risk of complications is higher. Surgery will get rid of the hernia and prevent any serious complications, although there's a chance of it returning after the operation. An umbilical hernia repair is a relatively simple procedure that normally takes about 20 to 30 minutes. General anaesthetic is usually used so there's no pain while the operation is carried out. In children, the weak spot in the abdominal wall is usually closed with stitches. If the hernia is large or in adults, a special mesh may be used to strengthen the area instead. You or your child should be able to go home on the same day as the operation. You may feel a bit sore and uncomfortable while you recover. You'll need to limit strenuous activities for a few weeks after the operation, and 1 or 2 weeks off school or work is often recommended. Most people are able to return to all their normal activities within a month of surgery. Are there any risks from surgery? These complications occur in less than 1 in 10 people (less than 10%).